Below are examples and explanations of each of my three calligraphic styles. There are modifications that can be made to each to make them match your invitation suite perfectly. For more images, please visit my portfolio! My modern style is done completely upright and can be customized to match your invitation suite. Choose from a mixture between calligraphy and caps or do all calligraphy. You can also choose to spread the zip code line along the bottom of the envelope or keep it in line with the city and state. My traditional style is written in a copperplate calligraphy style at a 55 degree angle. You can choose between center justification, left justification, or staggered justification. Zip codes can be kept in line or moved to the fourth line. My monoline style is done all at one thickness on a 55 degree angle instead of thickening the downstrokes as seen in most calligraphic styles. 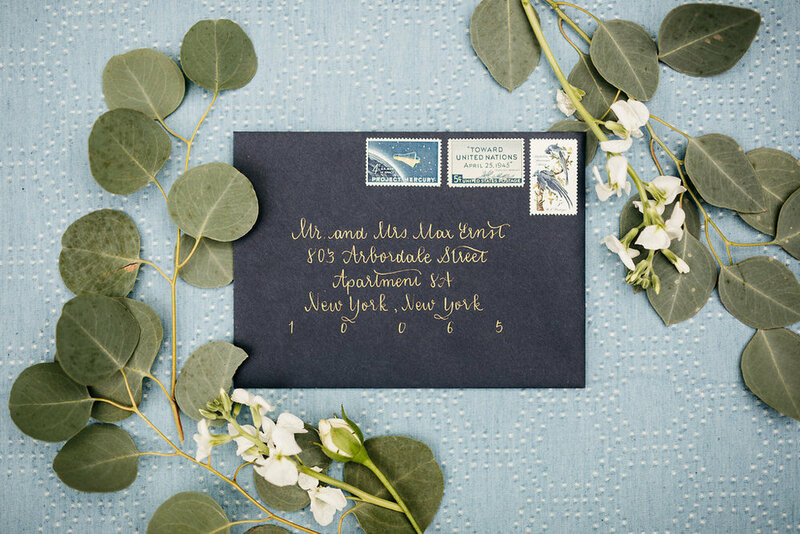 We can customize the justification and zip code placement to match your invitation suite.